I hope you are having a great Saturday. I know I'm glad the weekend is here. Today I want to share a card I made for my niece. Her birthday was a couple of days ago. I hope you like it. It was very easy to make. I used the Fun & Fast Notes set and some Dazzling Diamond Glitter. Someone asked why I show such simple cards. Well, not every one is ready for advanced techniques. I want to share projects for all level of stampers. 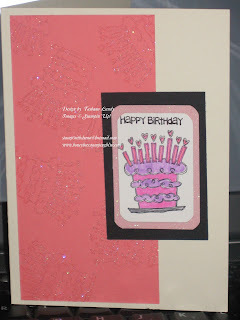 I want everyone to join in and have fun stamping. Don't miss out on the savings. The 15% off select new stamps will be over on September 30th. Celebrate World Card Making Day Oct. 4-11 and enjoy 20% off select items. Most importantly, don't miss out on a great opportunity. Purchase a Mini Starter Kit for just $99. Join my team during this promotion and receive a Punch ($15.95 value) for free*. *This offer only valid with Tashana Lundy 8/11-10/11.